Odoo uses a client/server architecture in which clients are web browsers accessing the Odoo server via RPC. Business logic and extension is generally performed on the server side, although supporting client features (e.g. new data representation such as interactive maps) can be added to the client. The server is stopped by hitting Ctrl-C twice from the terminal, or by killing the corresponding OS process. Both server and client extensions are packaged as modules which are optionally loaded in a database. Odoo modules can either add brand new business logic to an Odoo system, or alter and extend existing business logic: a module can be created to add your country's accounting rules to Odoo's generic accounting support, while the next module adds support for real-time visualisation of a bus fleet. Everything in Odoo thus starts and ends with modules. Each module is a directory within a module directory. Module directories are specified by using the --addons-path option. An Odoo module is declared by its manifest. See the manifest documentation information about it. A module is also a Python package with a __init__.py file, containing import instructions for various Python files in the module. The command creates a subdirectory for your module, and automatically creates a bunch of standard files for a module. Most of them simply contain commented code or XML. The usage of most of those files will be explained along this tutorial. Use the command line above to create an empty module Open Academy, and install it in Odoo. Invoke the command odoo.py scaffold openacademy addons. Adapt the manifest file to your module. Don't bother about the other files. A key component of Odoo is the ORM layer. This layer avoids having to write most SQL by hand and provides extensibility and security services2. Business objects are declared as Python classes extending Model which integrates them into the automated persistence system. The label of the field in UI (visible by users). If True, the field can not be empty, it must either have a default value or always be given a value when creating a record. Long-form, provides a help tooltip to users in the UI. There are two broad categories of fields: "simple" fields which are atomic values stored directly in the model's table and "relational" fields linking records (of the same model or of different models). Example of simple fields are Boolean, Date, Char. By default, Odoo also requires a name field on all models for various display and search behaviors. The field used for these purposes can be overridden by setting _rec_name. Define a new data model Course in the openacademy module. A course has a title and a description. Courses must have a title. Edit the file openacademy/models.py to include a Course class. Odoo is a highly data driven system. Although behavior is customized using Python code part of a module's value is in the data it sets up when loaded. Module data is declared via data files, XML files with <record> elements. Each <record> element creates or updates a database record. <field> elements have a name which is the name of the field in the model (e.g. description). Their body is the field's value. Data files have to be declared in the manifest file to be loaded, they can be declared in the 'data' list (always loaded) or in the 'demo' list (only loaded in demonstration mode). Create demonstration data filling the Courses model with a few demonstration courses. Edit the file openacademy/demo.xml to include some data. Because menus are somewhat complex to declare there is a <menuitem> shortcut to declare an ir.ui.menu and connect it to the corresponding action more easily. <menuitem id="menu_ideas" parent="menu_root" name="Ideas" sequence="10"
The action must be declared before its corresponding menu in the XML file. Data files are executed sequentially, the action's id must be present in the database before the menu can be created. Views define the way the records of a model are displayed. Each type of view represents a mode of visualization (a list of records, a graph of their aggregation, …). Views can either be requested generically via their type (e.g. a list of partners) or specifically via their id. For generic requests, the view with the correct type and the lowest priority will be used (so the lowest-priority view of each type is the default view for that type). 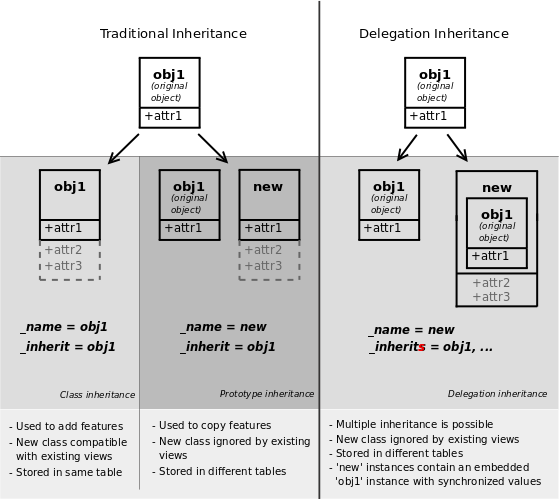 View inheritance allows altering views declared elsewhere (adding or removing content). The view's content is XML. The arch field must thus be declared as type="xml" to be parsed correctly. Tree views, also called list views, display records in a tabular form. Forms are used to create and edit single records. Create your own form view for the Course object. Data displayed should be: the name and the description of the course. In the Course form view, put the description field under a tab, such that it will be easier to add other tabs later, containing additional information. <button string="Mark as done" type="object" name="action_done"
<button string="Reset to draft" type="object" name="action_draft"
If no search view exists for the model, Odoo generates one which only allows searching on the name field. Allow searching for courses based on their title or their description. A record from a model may be related to a record from another model. For instance, a sale order record is related to a client record that contains the client data; it is also related to its sale order line records. For the module Open Academy, we consider a model for sessions: a session is an occurrence of a course taught at a given time for a given audience. Create a model for sessions. A session has a name, a start date, a duration and a number of seats. Add an action and a menu item to display them. Make the new model visible via a menu item. Create the class Session in openacademy/models.py. Add access to the session object in openacademy/view/openacademy.xml. Relational fields link records, either of the same model (hierarchies) or between different models. A course has a responsible user; the value of that field is a record of the built-in model res.users. A session has an instructor; the value of that field is a record of the built-in model res.partner. A session is related to a course; the value of that field is a record of the model openacademy.course and is required. add them in the views. Using the inverse relational field one2many, modify the models to reflect the relation between courses and sessions. add the field in the course form view. Using the relational field many2many, modify the Session model to relate every session to a set of attendees. Attendees will be represented by partner records, so we will relate to the built-in model res.partner. Adapt the views accordingly. add the field in the form view. Odoo provides two inheritance mechanisms to extend an existing model in a modular way. override existing methods on a model. The second inheritance mechanism (delegation) allows to link every record of a model to a record in a parent model, and provides transparent access to the fields of the parent record. Instead of modifying existing views in place (by overwriting them), Odoo provides view inheritance where children "extension" views are applied on top of root views, and can add or remove content from their parent. When matching a single element, the position attribute can be set directly on the element to be found. Both inheritances below will give the same result. This is the opportunity to introduce the developer mode to inspect the view, find its external ID and the place to put the new field. In Odoo, Domains are values that encode conditions on records. A domain is a list of criteria used to select a subset of a model's records. Each criteria is a triple with a field name, an operator and a value. A domain parameter can be added to relational fields to limit valid records for the relation when trying to select records in the client interface. When selecting the instructor for a Session, only instructors (partners with instructor set to True) should be visible. Create new partner categories Teacher / Level 1 and Teacher / Level 2. The instructor for a session can be either an instructor or a teacher (of any level). So far fields have been stored directly in and retrieved directly from the database. Fields can also be computed. In that case, the field's value is not retrieved from the database but computed on-the-fly by calling a method of the model. To create a computed field, create a field and set its attribute compute to the name of a method. The computation method should simply set the value of the field to compute on every record in self. The object self is a recordset, i.e., an ordered collection of records. It supports the standard Python operations on collections, like len(self) and iter(self), plus extra set operations like recs1 + recs2. Iterating over self gives the records one by one, where each record is itself a collection of size 1. You can access/assign fields on single records by using the dot notation, like record.name. Define the start_date default value as today (see Date). Add a field active in the class Session, and set sessions as active by default. Odoo has built-in rules making fields with an active field set to False invisible. The "onchange" mechanism provides a way for the client interface to update a form whenever the user has filled in a value in a field, without saving anything to the database. For instance, suppose a model has three fields amount, unit_price and price, and you want to update the price on the form when any of the other fields is modified. To achieve this, define a method where self represents the record in the form view, and decorate it with onchange() to specify on which field it has to be triggered. Any change you make on self will be reflected on the form. For computed fields, valued onchange behavior is built-in as can be seen by playing with the Session form: change the number of seats or participants, and the taken_seats progressbar is automatically updated. Add an explicit onchange to warn about invalid values, like a negative number of seats, or more participants than seats. Odoo provides two ways to set up automatically verified invariants: Python constraints and SQL constraints. Add a constraint that checks that the instructor is not present in the attendees of his/her own session. SQL constraints are defined through the model attribute _sql_constraints. The latter is assigned to a list of triples of strings (name, sql_definition, message), where name is a valid SQL constraint name, sql_definition is a table_constraint expression, and message is the error message. Since we added a constraint for the Course name uniqueness, it is not possible to use the "duplicate" function anymore (Form ‣ Duplicate). Re-implement your own "copy" method which allows to duplicate the Course object, changing the original name into "Copy of [original name]". Clauses are separated by ;, the color and condition are separated by :. Either "top" or "bottom". Makes the tree view editable in-place (rather than having to go through the form view), the value is the position where new rows appear. Modify the Session tree view in such a way that sessions lasting less than 5 days are colored blue, and the ones lasting more than 15 days are colored red. The name of the field used for color segmentation. Colors are automatically distributed to events, but events in the same color segment (records which have the same value for their @color field) will be given the same color. Add a Calendar view to the Session model enabling the user to view the events associated to the Open Academy. Search view <field> elements can have a @filter_domain that overrides the domain generated for searching on the given field. In the given domain, self represents the value entered by the user. In the example below, it is used to search on both fields name and description. <field name="description" string="Name and description"
To use a non-default search view in an action, it should be linked using the search_view_id field of the action record. The action can also set default values for search fields through its context field: context keys of the form search_default_field_name will initialize field_name with the provided value. Search filters must have an optional @name to have a default and behave as booleans (they can only be enabled by default). Add a button to filter the courses for which the current user is the responsible in the course search view. Make it selected by default. Add a button to group courses by responsible user. Horizontal bar charts typically used to show project planning and advancement, their root element is <gantt>. Add a Gantt Chart enabling the user to view the sessions scheduling linked to the Open Academy module. The sessions should be grouped by instructor. Graph views allow aggregated overview and analysis of models, their root element is <graph>. Graph views have 4 display modes, the default mode is selected using the @type attribute. a bar chart, the first dimension is used to define groups on the horizontal axis, other dimensions define aggregated bars within each group. Graph views perform aggregations on database values, they do not work with non-stored computed fields. Add a Graph view in the Session object that displays, for each course, the number of attendees under the form of a bar chart. Used to organize tasks, production processes, etc… their root element is <kanban>. A kanban view shows a set of cards possibly grouped in columns. Each card represents a record, and each column the values of an aggregation field. For instance, project tasks may be organized by stage (each column is a stage), or by responsible (each column is a user), and so on. Kanban views define the structure of each card as a mix of form elements (including basic HTML) and QWeb. Add a Kanban view that displays sessions grouped by course (columns are thus courses). Workflows are models associated to business objects describing their dynamics. Workflows are also used to track processes that evolve over time. Add a state field to the Session model. It will be used to define a workflow-ish. A sesion can have three possible states: Draft (default), Confirmed and Done. Workflows may be associated with any object in Odoo, and are entirely customizable. Workflows are used to structure and manage the lifecycles of business objects and documents, and define transitions, triggers, etc. with graphical tools. Workflows, activities (nodes or actions) and transitions (conditions) are declared as XML records, as usual. The tokens that navigate in workflows are called workitems. Replace the ad-hoc Session workflow by a real workflow. Transform the Session form view so its buttons call the workflow instead of the model's methods. Automatically transition sessions from Draft to Confirmed when more than half the session's seats are reserved. Replace the Python methods for synchronizing session state by server actions. Both the workflow and the server actions could have been created entirely from the UI. Access control mechanisms must be configured to achieve a coherent security policy. Groups are created as normal records on the model res.groups, and granted menu access via menu definitions. However even without a menu, objects may still be accessible indirectly, so actual object-level permissions (read, write, create, unlink) must be defined for groups. They are usually inserted via CSV files inside modules. It is also possible to restrict access to specific fields on a view or object using the field's groups attribute. Access rights are defined as records of the model ir.model.access. Each access right is associated to a model, a group (or no group for global access), and a set of permissions: read, write, create, unlink. Such access rights are usually created by a CSV file named after its model: ir.model.access.csv. Create a new user "John Smith". Then create a group "OpenAcademy / Session Read" with read access to the Session model. A record rule restricts the access rights to a subset of records of the given model. A rule is a record of the model ir.rule, and is associated to a model, a number of groups (many2many field), permissions to which the restriction applies, and a domain. The domain specifies to which records the access rights are limited. Here is an example of a rule that prevents the deletion of leads that are not in state cancel. Notice that the value of the field groups must follow the same convention as the method write() of the ORM. Add a record rule for the model Course and the group "OpenAcademy / Manager", that restricts write and unlink accesses to the responsible of a course. If a course has no responsible, all users of the group must be able to modify it. Wizard records are not meant to be persistent; they are automatically deleted from the database after a certain time. This is why they are called transient. Wizard models do not require explicit access rights: users have all permissions on wizard records. Wizard records may refer to regular records or wizard records through many2one fields, but regular records cannot refer to wizard records through a many2one field. We want to create a wizard that allow users to create attendees for a particular session, or for a list of sessions at once. Create a wizard model with a many2one relationship with the Session model and a many2many relationship with the Partner model. Wizards are launched by ir.actions.act_window records, with the field target set to the value new. The latter opens the wizard view into a popup window. The action may be triggered by a menu item. There is another way to launch the wizard: using an ir.actions.act_window record like above, but with an extra field src_model that specifies in the context of which model the action is available. The wizard will appear in the contextual actions of the model, above the main view. Because of some internal hooks in the ORM, such an action is declared in XML with the tag act_window. Wizards use regular views and their buttons may use the attribute special="cancel" to close the wizard window without saving. Define a form view for the wizard. Add the action to launch it in the context of the Session model. Define a default value for the session field in the wizard; use the context parameter self._context to retrieve the current session. Add buttons to the wizard, and implement the corresponding method for adding the attendees to the given session. Modify the wizard model so that attendees can be registered to multiple sessions. Each module can provide its own translations within the i18n directory, by having files named LANG.po where LANG is the locale code for the language, or the language and country combination when they differ (e.g. pt.po or pt_BR.po). Translations will be loaded automatically by Odoo for all enabled languages. Developers always use English when creating a module, then export the module terms using Odoo's gettext POT export feature (Settings ‣ Translations ‣ Import/Export ‣ Export Translation without specifying a language), to create the module template POT file, and then derive the translated PO files. Many IDE's have plugins or modes for editing and merging PO/POT files. The GNU gettext format (Portable Object) used by Odoo is integrated into LaunchPad, making it an online collaborative translation platform. Choose a second language for your Odoo installation. Translate your module using the facilities provided by Odoo. Odoo 8.0 comes with a new report engine based on QWeb, Twitter Bootstrap and Wkhtmltopdf. Because reports are standard web pages, they are available through a URL and output parameters can be manipulated through this URL, for instance the HTML version of the Invoice report is available through http://localhost:8069/report/html/account.report_invoice/1 (if account is installed) and the PDF version through http://localhost:8069/report/pdf/account.report_invoice/1. If it appears that your PDF report is missing the styles (i.e. the text appears but the style/layout is different from the html version), probably your wkhtmltopdf process cannot reach your web server to download them. If you check your server logs and see that the CSS styles are not being downloaded when generating a PDF report, most surely this is the problem. report.url, pointing to an URL reachable from your server (probably http://localhost:8069 or something similar). It will be used for this particular purpose only. web.base.url.freeze, when set to True, will stop the automatic updates to web.base.url. For each session, it should display session's name, its start and end, and list the session's attendees. Define a dashboard containing the graph view you created, the sessions calendar view and a list view of the courses (switchable to a form view). This dashboard should be available through a menuitem in the menu, and automatically displayed in the web client when the OpenAcademy main menu is selected. Odoo is accessible through XML-RPC/JSON-RPC interfaces, for which libraries exist in many languages. Write a Python program able to send XML-RPC requests to a PC running Odoo (yours, or your instructor's). This program should display all the sessions, and their corresponding number of seats. It should also create a new session for one of the courses. Examples can be easily adapted from XML-RPC to JSON-RPC. writing raw SQL queries is possible, but requires care as it bypasses all Odoo authentication and security mechanisms.